Far Cry 5 Antagonist Revealed! Get hype, ladies and gentlemen. The Far Cry 5 antagonist has been revealed, as well as a teaser trailer, and both look amazing! 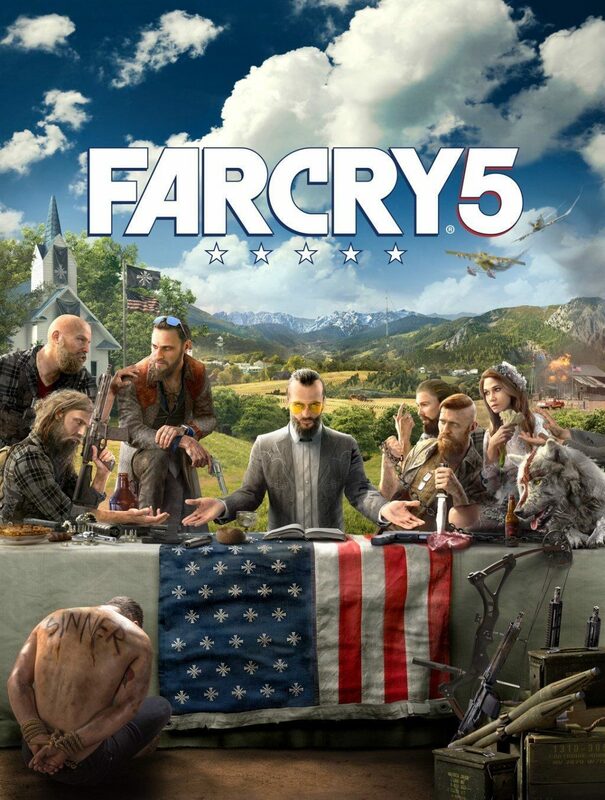 You can tell Ubisoft is going for a Last Supper vibe with this reveal, the main antagonist obviously occupying the middle, and what appears to be the rest of the members of a Christian cult on his left and right. On top of that, the image is rife with religion, violence, and politics, so it seems Ubisoft is boldly going to tackle some serious issues currently being faced in the US with this game. We see the American flag with the stars replaced by what appears to be a variation of the Iron Cross, an iconic symbol used by the Germans in both world wars. We also see a church in the background draped with the same variation on the Iron Cross, a captive with the word “SINNER” carved into his back, what looks to be a jug full of moonshine, a beer, a pie, a raw steak, plenty of guns, and OH YEAH, a wolf. While filled with rural Americana, the image also clearly paints a picture of the radical extremism that currently exists within the US today. The game is to be set in Montana, and appears to boast beautiful graphics. Now, we all know this trailer has been pre-rendered to look absolutely stunning, but if the graphics for the actual game are even half as good as what we see here, then we’re in for a treat. Check out the teaser trailer below! Next articleRoadhog and Junkrat Dance Emote Easter Egg!